(PHOTO CREDIT: Brad Fallin, Dobbins PA) Lindsey with her daughter, Abby. MILLIGAN COLLEGE, TN (Nov. 8, 2013) — Lindsey Black, 29, has worn a uniform for almost 10 years. Recently, the Air Force veteran and reservist added a different type of uniform to her wardrobe ― a Milligan College jersey. This year, Black celebrates her first Veterans Day as a college student. She is a freshman psychology major and a member of Milligan’s track and field team. Though she is a full-time student, military service remains a big part of her life. 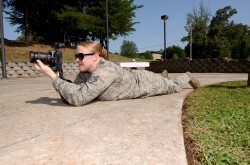 As a member of the Air Force Reserves, Black drives from her Johnson City, Tenn., apartment to Atlanta one weekend each month to serve at Dobbins Air Reserve Base. Black, a native of Dallas, spent her 20th birthday in basic training in San Antonio, Texas. While in the Air Force, she received training and worked as a graphic designer and broadcast journalist. She was stationed in California when she met her husband, who also served in the Air Force. They married in 2005. In 2006, Black was deployed to Iraq where she spent five months working as a Force Protection troop, assisting with base security. While in Iraq, Black also volunteered at the hospital on base, where she saw injuries ― physical and mental ― take their toll on her peers. The time in Iraq took its toll on Black, as well. After she returned home, she was diagnosed with PTSD (Post-traumatic stress disorder). “It’s affected my memory, my relationships and also the intensity of how I care about people and how they’re treated,” Black said. 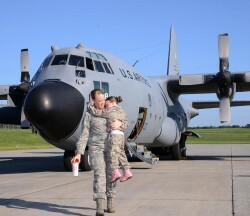 Despite her setback, Black received counseling and continued her full-time military career until she became pregnant with her first child in 2008. At that time, she went off active duty in order to care for her daughter and her husband, who is now a disabled veteran. As her daughter grew older, Black started thinking more about her experience in Iraq and how it could impact her future. Her PTSD and the counseling she received triggered a desire to study psychology. College would be necessary to accomplish this goal, so Black started exploring her options. Milligan’s voluntary participation in the Yellow Ribbon Program, a provision of the Post-9/11 Veterans Education Assistance Act of 2008, was another incentive for Black. This program allows institutions of higher learning to voluntarily enter an agreement with the VA to fund tuition and fees expenses that exceed the maximum tuition and fee reimbursement for the academic year. Milligan provides a Yellow Ribbon Scholarship up to 50 percent of remaining expenses, and the VA will match the same amount as the institution. In addition to this program, for the fifth year in a row Milligan was named a Military Friendly School by Victory Media, the premier entity for military personnel transitioning into civilian life. While her professors, classmates and coaches have been helpful in her transition, Black faces many challenges that the majority of her peers at Milligan do not understand. “I am still acclimating myself to a civilian environment, and sometimes I have to remind myself that most of my classmates and teammates are 18, 19, 20 years old and have not experienced what I have,” said Black, a first-generation college student. As the mother of a kindergarten student at Happy Valley Elementary, Black’s motherly and military instincts carry over into other areas of her life. On the track and field team, Black earned the nickname “Mama Bear” because she often cares for her teammates when they are sick or need someone to listen to them. “But I also have to be careful not to step on any toes because I am used to how we did things in the military, and it’s different than how things work on our team or in the classroom,” she said. Black’s biggest supporter is her husband. “He loves being a stay-at-home dad and helping to keep things running smoothly at home so I can go to school,” she said. Though her “civilian” tasks of studying, going to practice and playing with her daughter will dominate her Veterans Day this year, Black and her husband plan to quietly celebrate by eating out at a restaurant that honors veterans with a free meal. Then, it’s back to the books. Posted by tommy on November 8, 2013.